Mr. Nicklaus personally spent many hours walking the rugged coastline, quiet desert foothills and shaded canyons of El Dorado envisioning a course that blends with rather than dominates the natural landscape. The result is a golf course that links the drama of the coast to the desert in a new translation of golf’s great architectural traditions. 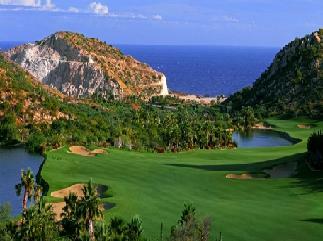 El Dorado is a stunning and memorable golf course. There are 4 sets of tees and rolling saddled fairways leading to scenic green sites and head-turning bunker complexes. Imbued with a friendly, casual ambiance, El Dorado’s golf staff adheres to the highest standards and upholds the time-honored traditions of the game. Within this relaxed environment, you will be free to share the game’s history and etiquette with members of your family as you walk the fairways accompanied by a uniformed caddie. Or you may to choose to get a regular game going with other club members. Whatever the reason you play the game of golf may be, El Dorado will provide the perfect stage. Private non-equity membership club structure limited to 350 memberships. 18-hole Jack Nicklaus designed private golf course. The El Dorado golf course is already ranked as one of the top courses in the world. Luxurious golf and beach club, featuring: World-class spa facilities; State-of-the-art fitness center; Members' shopping boutique - Inviting men's and women's lounge and locker areas; Resort-style swimming facilities; Numerous indoor and outdoor dining facilities from casual poolside fare to exquisite 5-star dining; and Championship-style tennis courts.